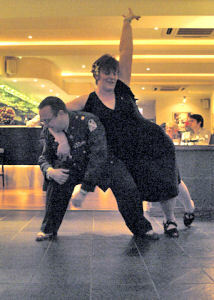 Lynn and Paul Thornton have been dancing Lindy Hop, as well as modern jive, for many years in the south west region and are known for their distinct style of swing jive dancing. Paul also DJs as "Zoot" Thornton for jive and swing dances and Lynn sings in several bands, including her own swing jive band called Just Misbehavin'. They run monthly lindy hop workshops where you can learn this great swing dance in a very relaxed and friendly atmosphere. All workshops include core basic moves, but build to incorporate more intermediate moves over the afternoon and are particularly suitable for anyone who has other dance experience and wants to expand their lindy / swing jive move repertoire. Workshops are held most months (see forthcoming events below), except for a break over summer (normally during July and August), and run from 1:45pm to 5.30pm at Clyst St George Parish Hall, Woodbury Road, Clyst St George, Near Exeter (Venue Map). They cost £10 per person on the day for the whole afternoon session, or £9 per session in advance when paid as a 4 or 5 / 5 or 6 session block. Tea, coffee, biscuits, cake and fruit is included in the price. Pre-booking for individual workshops is recommended to ensure a place. Private lesson options are also available - please enquire for full details. Rights Of Admission Reserved (ROAR) and Errors & Omissions Excepted (E&OE).